Accounts store a list of unique IDs for email already seen. 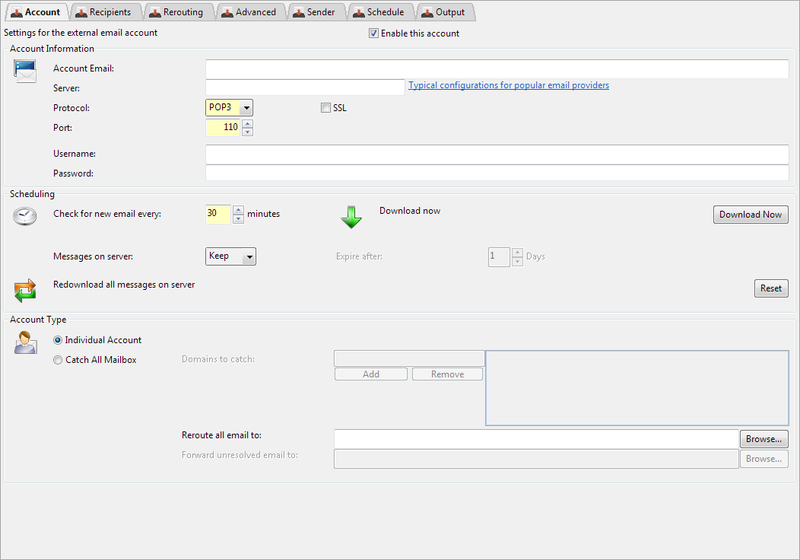 This ID cache is used to work out what new email to download. WARNING: If you are keeping or expiring email on the POP3 server then clearing the cached ID list can result in duplicate email being downloaded and delivered to your server. An exception to this behaviour is Microsoft Exchange, which implicitly deduplicates by the MIME Message ID, so even if you redownload email and redeliver to Microsoft Exchange they may not appear in your Exchange mailbox. Exchange does not log this behaviour, or document for how long it caches Message IDs. The domains associated with this account. This is used to catch all email that have recipients matching these domains. If example.com is specified (or *@example.com or @example.com) then any email with recipients at that domain will be forwarded to that recipient on your email server. So an email with recipients a@example.com and b@somewhereelse.com will be sent to your email server for delivery to a@example.com. You can specify multiple domains to catch e.g abc.com, abc.co.uk. Email to any of the domains will be retrieved and delivered. It will be readdressed according to your Reroute To setting (which can be *@newdomain.com) to have all domain info stripped and replaced with newdomain.com.